-- Select a Size/Color -- Size 0 - Out of Stock! Size 1 Size 2 - Out of Stock! Size 4 - Out of Stock! Size 5 - Out of Stock! Get ready for some sun and surf with these stylish Orange Dog Swim Trunks! 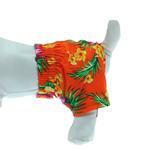 Bright orange color accented with Hawaiian flower pattern. Design provides comfort and makes it easy to get on and off. 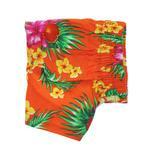 Fun in the sun begins with these Orange Dog Swim Trunks! 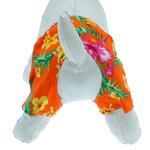 Your pup will look cool in this dog swimsuit whether hangin' ten in the surf or hangin' by the pool. Make your pup stand out by wearing this summer's coolest dog clothes. Hawaiian Swim and Board Dog Trunks - Orange Customer Photos - Send us your photo! Marty says, "board shorts are way cooler than a speedo!" Bentley is ready for the beach sporting his new bathing suit and sun visor !! Love my new swim trunks! Ready to go in the pool! This is Oliver in his summer outfit that he got from Baxter Boo. He thinks he's a pretty cool dog now. Harvey loves the beach! Here he is with his new swim trunks at Coney Island! Posted On 06/05/16 by Latasha A from Russellville, AR Yes, Latasha A recommends this product! They were great to return wrong size with a full refund. soooo I am ordering again for correct size. Thanks.